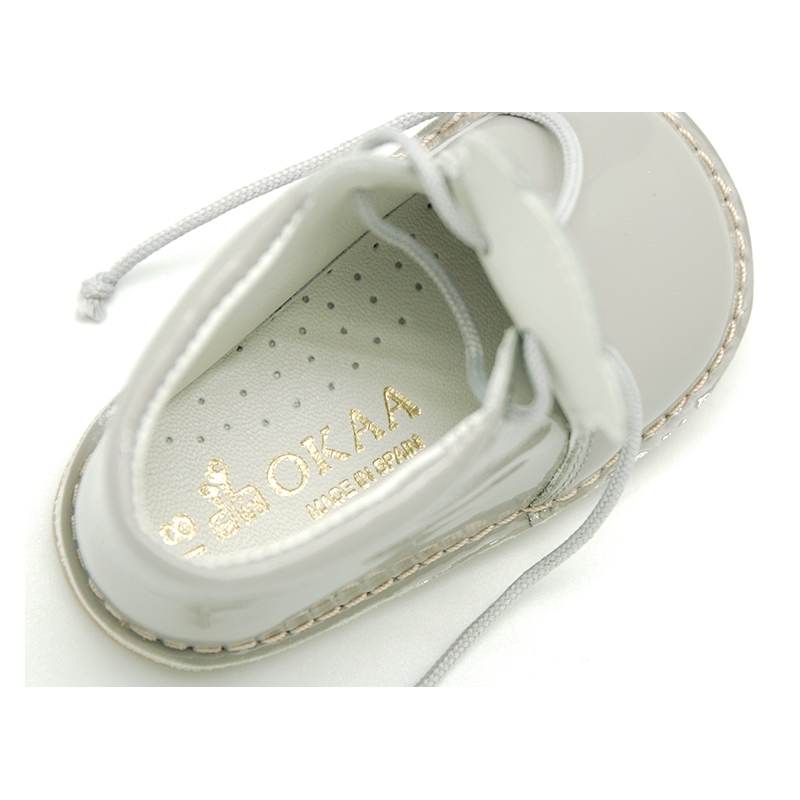 Okaaspain, tienda online de botitas safaris bebé o pisakk en piel charol pasteles con cordones. > Babies>Safari Boots>Little bear safari boots in soft colors patent leather. Little bear safari boots in soft colors patent leather. Little bear safari boots with EXTRA FLEXIBLE soles in soft colors and patent leather. SPECIAL BABIES. More info about Little bear safari boots in soft colors patent leather. Little bear Safari Style boots for babies and pre-walkers with laces and extra flexible outsole in soft coloros patent leather. ItÂ´s an Special model for babieÂ´s feet. Really smart!. ItÂ´s a renovated design of the classic safari boots. Very sweet with a little bear design to mix and macth with all the little garments this autumn winter. Made up of 100% natural high quality nappa leather with patent finish. 100% calfskin with patent finish. Made up in soft pastel colros, perfect for babies looks. OKAA EXCLUSIVE MODEL. Available in 5 colors. Range of sizes: from 16 Euro size up to 23 Euro size. SIZING QUITE WIDE, for this reason we reccomend to choose a smaller size to regular one, unless baby have bigger feet. Data sheet about Little bear safari boots in soft colors patent leather.